Titan Ansi 4196 Pumps and parts: Titan manufactures and markets a wide range of Titan 4196 ANSI pumps and parts which conform to ANSI B73.1M specifications. Titan 4196 ANSI pumps are available in ST, MT, TXLT models and sizes. Standard Pumps are in Ductile Iron, Stainless Steel 316 and, CD4 construction. Titan pumps are designed for applications in the chemical, process, pulp and paper, oil and gas, textile, breweries, power generation, and petro-chemical industry just to name a few. 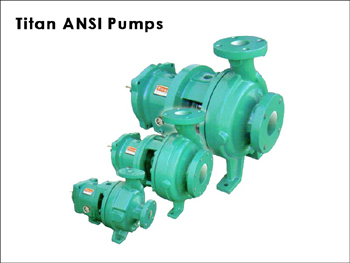 Click here for Titan Ansi 4196 Pumps Detailed Specifications.